Do you remember your childhood video game where you control a spaceship and shoot enemies that try to destroy your home planets? Yes that’s Space Invaders back in the day, or maybe Galaga. They made the board game version but with a nice add-on, a dexterity element just because it would make the game more appealing. In Flip Ships (aka Flipships), players will work together to prevent your home planet gets destroyed by Alien ships. You need to destroy all enemies and the mothership before they destroyed your planet. Players will control 2 ships (and eventually more) and will flick them towards the enemies / mothership. Yup, flick them with your finger(s), hence the dexterity element. The enemies come in the form or cards lined up in several rows (called moon areas), if your ship land on the cards after it’s flicked, then it’s considered to found it’s target. Some enemies though, have to be hit twice to be destroyed, or shielded by another ship. After all players take their turns, the enemies move towards our planet, once they enter the atmosphere zone, they will deal damage to our planet (based on the value on each card) and return back to the deck. Our planet have 20 health points at the start of the game, so better hurry avoid those hits, once it’s zero, the players lose. When the health point is reduced, players might unlocked new ships (there are three levels of ships) and each player’s ships has different abilities one from another. The mothership is a giant 4 sided cardboard with a huge hole in the center. Players need to flick their ships into that hole to damage the mothership. It’s placed on the most rear position, thus it’s very difficult to hit. Players need to hit the mothership a number of times based on the difficulty level. If there are less than 6 enemy cards, the final assault will be triggered and players need to destroy the mothership in that round. If not, the mothership will deal 20 damage to our planet and it’s instant defeat for players. The game is pretty simple, straightforward and plays very fast. But it’s hard to master. You need to learn and practice to flick your ship. Aim your flick is not easy, you need a lot of practice and get used to it before you can master it. I found the game to be fun, not amazing but it’s fun to be played with friends and family. I wouldn’t mind a coop game like this. 30 minutes of fun flicking tokens, why not? Keep in mind, that while you can adjust the difficulty, the game still the same. So it has low replay value. There is a speed variant but I think it’s not the same and not really improving the game. Another thing is that you might want to choose where you play this game. In public places with many people and crowd, not really a good choice because you can flick the tokens around and lost it somewhere in the crowd. 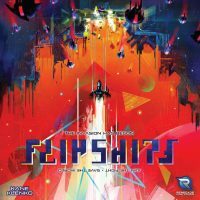 Add a Review for "Flip Ships"